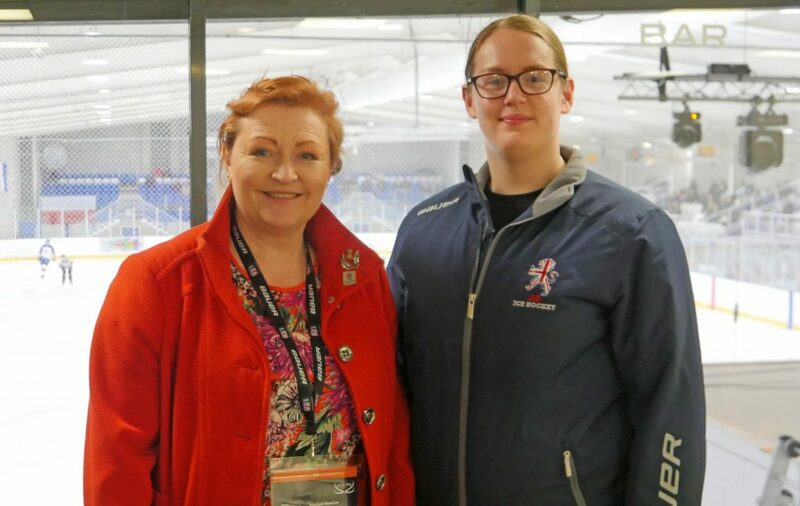 Emma Harper MSP and Scottish ice hockey star Beth Scoon have teamed up to encourage more girls and women in Dumfries & Galloway to take up the sport. Dumfries is just one of a handful of communities in Scotland with the facilities to provide ice hockey, and the Ice Bowl is home to a number of local teams, including Solway Sharks Ladies – the only Scottish team competing in the UK’s top women’s ice hockey league. The Sharks also put on regular learn to play sessions for girls and women of all ages to encourage them to try the sport. The South Scotland MSP met Scoon, who is the assistant captain of the GB women’s senior side, at last month’s U18 women’s world championship held at Dumfries Ice Bowl, a tournament which saw Great Britain pick up the bronze medal with a side containing three Scots, including Dumfries’ own Megan Gourlay, who plays for the Solway Sharks Ladies side. Due to a lack of girls’ teams when she was growing up in Kirkcaldy, Beth, 23, had to play alongside boys at youth level but believes there are now better opportunities for girls to get involved in the sport, particularly for those living in the Dumfries area. “I grew up playing with the boys in the junior set up. There was no Solway Ladies or any other teams while i was growing up, so my only option was to play with the boys. So now for girls wanting to start out there are so many options, they can come and join a women’s team right away. “Even the number of Scottish girls, for example, in the GB U18s team now – there was only me from Scotland when I was that age. And now we’ve got at least three Scottish girls involved in the set up and that’s good to see and speaks volumes for hockey in Scotland and how it’s grown over the years. “I think the ground work is there for people to start as well now. For example, Megan Gourlay came along to the Solway junior team, the Solway Ladies, and she’s now worked her way up into the GB U18s team. So that’s great to see and shows that the framework is there for people to get involved at grassroots level and progress into the competitive and international teams. It’s proves that it can be done. “I was delighted to meet with Beth Scoon and hear about how it has become easier in Scotland for girls and women to get involved in the sport of ice hockey and that there are pathways in place for girls to progress from local sides to international level, with the rise of Megan Gourlay from Solway Sharks Ladies to the Great Britain national side a clear example of this. “I have attended Solway Sharks matches in the past and recently sponsored the Solway Sharks Ladies’ match against the Sheffield Shadows. Attending that much allowed me to meet with the Solway players and hear about their love for the sport and why it has been so beneficial to them in their lives – such as making friends and exercising regularly. Solway Sharks also have a number of male teams from under 10’s level through U12’s, U14’s U16’s, U20’s, as well as senior sides. Their learn to play schemes are for ages 4-15 years and only basic skating required and equipment is provided.